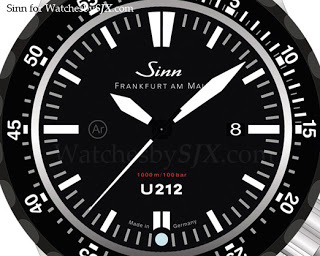 Sinn unveiled the impressive U212 SDR dive watch at Baselworld 2012. This is the (much) bigger version of the bestselling U1 diver. 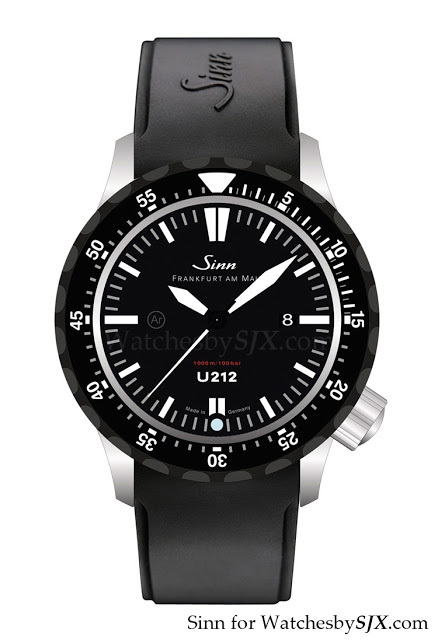 The Sinn U212 SDR has a 47 mm submarine steel case with a bezel that has been hardened with Sinn’s Tegiment process and black coated, hence the SDR label which stands for “schwarzem drehring”, or black bezel in English. This watch is equipped to deal with extreme environments. It can function between -45 °C and +80 °C because of the proprietary Sinn lubrication used for the ETA 2892 calibre. It is also equipped with EDR seals that are durable and chemical resistant. These minimise moisture penetration into the case, by 75% compared to regular seals, according to Sinn. In addition it has Sinn’s proprietary Argon dehumidifying technology; a capsule of copper sulphate located at six o’clock absorbs moisture from inside the watch case. This prevents moisture build up and also fogging when the watch is subject to a drastic change in temperature. The capsule, visible at six o’clock on the dial, starts out entirely white, but once it turns blue that signals the need for replacement. This is a limited edition of 212 pieces and apparently it sold out (to dealers) during Baselworld 2012, which is why the watch went straight to the archive section on the Sinn website. All in all the sort of apolcalypse-proof watch that Sinn does well. I already have the U1 but this one looks mighty impressive.